Today is the D-day for the Class 12 students of Bihar Board who have been awaiting the declaration of Bihar 12th Result 2019. As per the latest update, the Bihar School Examination Board (BSEB) will declare the Bihar 12th Result 2019 today at 2:30 PM. The news has put a wide grin on the faces of nearly 11 lakh students who are waiting for the BSEB 12th Result 2019 for Arts, Science and Commerce streams. This year, BSEB Intermediate Result 2019 for Science, Commerce and Arts is being declared earlier those previous years. Post the declaration, the Bihar Board Result 2019 will be made available online on the official website of the board i.e. Boards’ official website - biharboardonline.bihar.gov.in. Candidates will be able to access their BSEB Intermediate Result 2019 by logging into the website with their Roll Code and Roll Number. Until the declaration of BSEB 12th Result 2019, our team would provide you the latest updates and news about the upcoming BSEB Intermediate Result 2019 on this page. So, students are advised to bookmark this page and visit it regularly. They can also register for email alerts about BSEB 12th Result 2019 by submitting their email id and mobile number on this page. Taking into account transparency as one of its top priorities, the Bihar School Examination Board (BSEB) had introduced use of OMR Sheets and Bar Coding for all the answer sheets for the Board Exams this year. These changes have brought about positive changes and given the right results to the Board. The new measures also made the evaluation work more easy with the help of computer assisted evaluation centres. As stated earlier, the Bihar Board 12th Result 2019 is going to be announced today. However, if sources are to be believed Bihar Intermediate Result 2019 will be declared today which is earlier then the regular trend. Bihar Board result 2019 for class 12th student has been preponed owing to the upcoming Lok Sabha elections. This year, the Bihar Board Intermediate Exam 2019 is being conducted from 6th February to 16th February 2019. This is also in line with the annual academic calendar followed by the BSEB. This further supports the argument that the Bihar 12th Result 2019 will be declared on 30th March. Students are under tremendous pressure with regards to the upcoming Bihar Board 12th Result 2019. Some of this pressure is due to unrealistic expectations that students have set for themselves. In order to help students understand the existing competition and gauge their own performance in the upcoming Bihar Board 12th Result 2019, we have provided key statistics below. These statistics will help students to build a realistic outlook with regards to the Bihar Board Intermediate Result 2019. Looking at the performance of last year, the Bihar Board is hoping on a significant improvement in the overall pass percentage of students in the upcoming BSEB Intermediate Result 2019. It would be interesting to see if they manage to achieve it this year. How to check Bihar Intermediate Result 2019 online? The process of checking the Bihar Intermediate Result 2019 is quite simple and straightforward. But in the mix of emotions, students might need some assistance with regards to checking the Bihar Board 12th Result 2019 online. To help them, we have listed down the key steps involved in the process below. By following these simple steps, students will be able to check their Bihar Board 12th Result 2019 easily without any delay. After checking the Bihar 12th Result 2019, the website will also provide you the option to download a softcopy PDF or take a printout of the scorecard for the future reference. The printed / downloaded copy of the BSEB Intermediate Result 2019 can be used as a provisional result until the original mark sheets are made available by the Board. However, to complete the official formalities for further admission, students will require the original scorecard. Therefore, we advise students to collect the same from their respective schools in the coming weeks. To pass the Bihar Board Intermediate examination, the candidate must acquire 33 marks. But the marks are only applicable in practical subjects. It is compulsory for the candidates to score 30 points in 100 without subject matter. According to the board, it is mandatory for the candidate to score 21 marks out of 70 in theory papers and 12 out of 30 in practices. The board has made no changes in the marking system so far. The Board has not taken any decision on grace mark procedure yet. The board has confirmed that the decision will be taken after the papers are evaluated. However, if the board awards grace marks to any candidate, it will be updated on the official website. 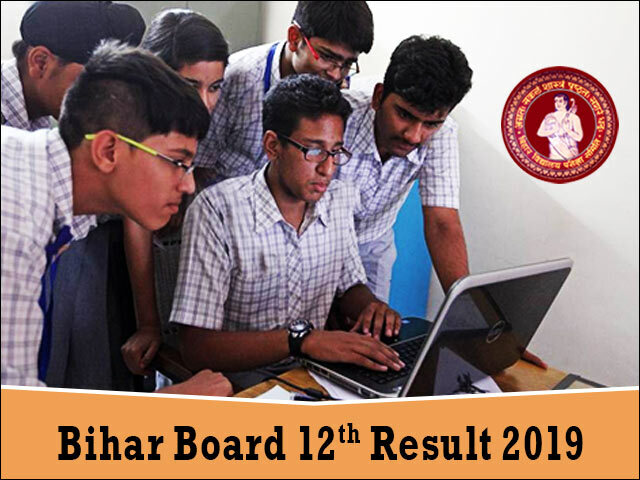 Being a life-defining landmark, the Bihar Board 12th Result 2019 plays a critical role in the academic and professional career of students. Therefore, if you feel that your Bihar Board Result 2019 for class 12 students is not up to your expectations you can apply for re-evaluation / rechecking of the answer sheets. The BSEB would charge a nominal fee with for re-checking the answer sheets. However, students must be sure about their performance in the exam and only then they should apply for the Bihar Board 12th Result 2019 re-checking. Like every year, this year also the Bihar School Examination Board will conduct the Intermediate Compartmental Examination 2019 for the students who fail in one or two subjects. The board will soon start the online link to fill the Online Application form for the Compartmental examination 2019. The candidates who will have to sit for the compartmental examination have to contact their school principal for the compartmental examination registration. The online application forms will be accepted once the dates are announced.